Penny Arcade Expo 2011 – Welcome to the Adventure! Posted on March 14, 2011	by Derek "Gamer Crash"
It was a great weekend in Boston. I’m still recovering from the whirlwind weekend and I’m a bit tired and sore here and there. Seriously, if you guys are able to ever attend a show like this whether it be in Boston or Seattle, you should. It’s our version of E3: for gamers, by gamers. There’s just nothing quite like attending PAX. So like I promised, here’s my recap of the show. What did I like? What were some disappointments? Check back each day this week as well as I’m going to give you guys an inside look at the games I got to play at the show. I’ll also tell you what I saw in the Rage panel. 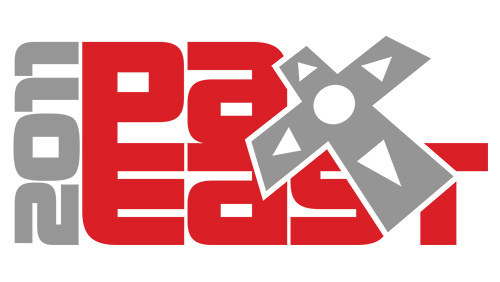 Venue: I felt that this years PAX East was way better than last year for one reason: the venue. The Hynes Convention Center is great but it just couldn’t contain the masses last year as most people I’m sure felt more like sardines packed in a tin can. The Boston Convention and Expo Center (BCEC from here on) provided ample space to move around. From the moment you walked in, the entrance was wide open. You were greeted by a large statue of “HIM”, the antagonist from the upcoming BioShock: Infinite. From there the expo hall was directly in front of you with the side hallways reserved for panels, console free play rooms, tournaments, and even some Rock Band and Dance Central stages. Couldn’t pay me enough to get up and do that. The big difference between the BCEC and the Hynes is that the Hynes tends to be extremely vertical right when you enter. You’re greeted by escalators immediately when you enter. The BCEC is New England’s largest convention center and honestly, it shows. The expo hall alone is actually the size of three hangers. The first contained the booths, while the second was for table top and card games and the final being the “queue room”, a staging area to line up before the event opens. The PA guys even managed to open a food court of sorts for hungry gamers. Kudos to the hard work guys. It really paid off. WB Games Booth: Warner Bros brought out the big guns this year. All 4 developers brough their games in as Turbine had Lord of the Rings Online and Dungeons and Dragons Online, Day 1 brought F.E.A.R. 3 (I refuse to write F.3.A.R. ), Snowblind brought their upcoming Lord of the Rings: War in the North, and the crown jewel, Netherrealm brought with them Mortal Kombat. The best part was that they had 8 booths each with a custom arcade cabinet for Mortal Kombat. Some contained PS3 and Xbox controllers while a couple featured fully working arcade sticks. So awesome. Microsoft’s presence: Microsoft once again brough their ‘A’ game with them and controlled 3 booths. Along for the ride was Homefront, Gears of War 3, a bunch of Kinect games, and upcoming XBLA games like Fire Pro Wrestling and Insanely Twisted Shadow Planet. They continue to be in the lead when it comes to support from the big three, though it was nice to see Nintendo expand their presence from just Pokemon this year as well. Really Sweet Booths: Some companies went above and beyond to make their booth totally awesome. THQ revamped their booth to make it look like Mars from Red Faction Armageddon. They even went as far as to bring in an EXO Suit so people could climb up and take a picture. Alienware also had a big presence at the show. Though I did like their Area 51 inspired booth last year (complete with Men In Black personas), they did create a cool atmosphere this year with black chain link fencing and bean bags decked out. They also held tournaments all day. Bethesda created an Ark inspired area for their upcoming shooter Brink, and Nintendo created a typical white and clean, Apple looking space for their booth. Finally, I’d be remiss if I didn’t mention The Behemoth. They had a simple yet awesome space as they brought in custom arcade cabinets for their games. They even had a 4 player arcade cabinet for some Castle Crashers action. Sony: After Last year’s no-show, I was excited to see Sony on the Expo Hall map this year. They have a bunch of exclusive games coming out this year so my thoughts were filled with games like Motorstorm Apocalypse, InFamous 2 and maybe Uncharted 3. Hey, I can dream, can’t I? After walking over, I was horrified to only see a fully decked out SOCOM 4 booth. That’s it. Come on Sony, why not try a little harder and show off more? Nintendo and Microsoft got the message. Ubisoft: Come on Ubi. You have a ton of top-level games due out this year like the new Driver and Ghost Recon: Future Soldier and you forget to bring any of them with you? After last year’s big booth including Splinter Cell and Prince of Persia, Ubisoft really dropped the ball only bringing Children of Eden and a slew of downloadable games. To really rub it in, they even had a glass case that promised a shirt for preordering Future Soldier. Long Lines: I would have liked to go hands on with a bunch of stuff including the 3DS, LA Noire, and Portal 2, but the lines for these 3 were absurdly long. In an effort not to waste most of the day in line, I decided to pass and check out other things. Capcom: Only the truly aware gamer would have realized that Capcom was indeed at the show. What’s even sadder than them being tucked away in a dark corner is that they only brought Street Fighter 4 and Marvel vs Capcom 3 with them. Overall, PAX East was a blast. It was great seeing the support from fans and the gaming industries continued support. Hopefully the show continues to grow each year. The panels were amazing, the lines were handled much better this year, and there was just so much to see and do. Now begins the long wait till next March. See you guys in 2012! This entry was posted in PAX East 11 and tagged Opinion, other. Bookmark the permalink. 1 Response to Penny Arcade Expo 2011 – Welcome to the Adventure!